Melanie is the developer and founder of Wisp Botanicals and wispcollection.com. Melanie has spent the past 20 years researching and investigating proper skin care applications and regime in order to create a line of products that are honest in their claims. 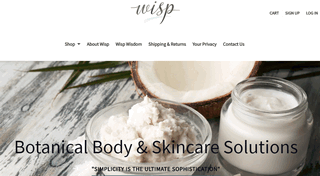 Wisp collection is a luscious skin care line that is suitable for most skin types. We removed toxic ingredients, like Formaldehyde,Sulphates, Phthalates, Parabens, Hydroquinone that are known health and skin hazards. Then we looked at ingredients that are potentially sensitizing to the skin, like Dyes/Colorants, Fragrance (including essential oils) and removed those, too. While we incorporate Natural and Organic ingredients whenever and wherever we can, we are not limited by them. Botanical extracts and Actives, like Peptides, are used in innovative ways to be of benefit to the skin. We never pick an ingredient simply for its marketing potential. We don't add ingredients of concern to our products, like Parabens, fragrance, DEA, sulfates, formaldehyde, colorants/dye, Animal products, Petroleum by products and Retinols. Our unconventional offerings of clean, safe and effective body and facial care and will leave your skin soft, supple and hydrated.